I just finished my first week here in Connecticut, and I didn’t waste any time in exploring the area. I took quick trips to New York City and Rhode Island. I hadn’t planned on going to NYC so early in my stay here, but I didn’t want to waste a free day and there is always more to do in NYC. 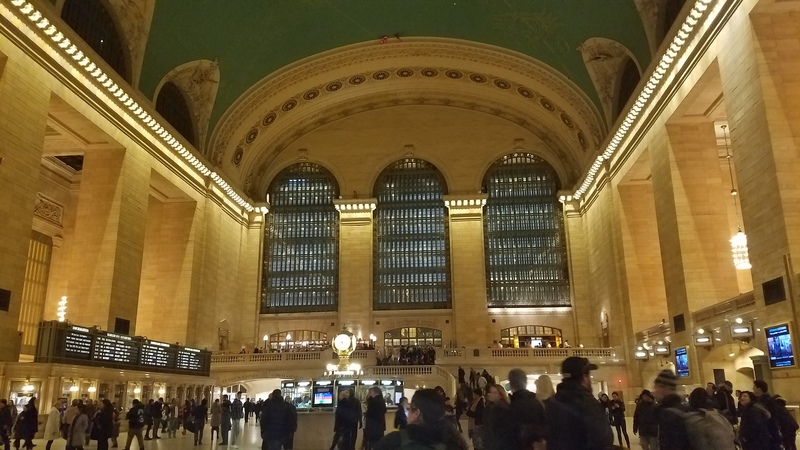 I took the train to New York, and I arrived at Grand Central Station to begin my day in the city. Arriving at Grand Central as a first welcome to the city was definitely a neat experience. After I got to New York, my first stop was the Theodore Roosevelt Birthplace Historic Site. I walked there, and it was definitely interesting to see a historic site in the middle of an otherwise typical city block. There was a big flag and a small sign outside stating that it was a historic site, but if you weren’t looking for it, it would be easy to miss. Inside there is a small museum with some of Roosevelt’s quotes and memories on exhibit. There was also a tour of the upstairs period rooms, but I didn’t arrive at a good time to go on the tour. It was a quick stop, and there was far less to see or do than many of the sites I had been to before. After the weekend, I realized that many of the monuments and historic sites in this area are much small and serve more as markers of locations or events than museums to their significance. I walked to my next planned stop, and I passed through Washington Square Park on the way. The arch in the park was definitely cool to get to see. I also really enjoyed getting to pass through a green space in the middle of the city. I headed to the Stonewall National Monument. The monument was very simple, and again served mostly as a marker of the Stonewall Riots and the movement for LGBT rights. The monument was designated as a National Park Service site in 2016, and it was neat to get to see how our remembrance and respect for different events in history has changed over time. My next stop was the Math Museum. The museum was very interactive. I had already done quite a bit of walking, and I was feeling a bit tired by the time I got to the math museum, so I may not have enjoyed it as much as I could have. It was really neat to see how interactive all of the displays were, and how much math and learning was still a part of all of the exhibits. I really enjoyed getting to see how different aspects and principles of math were presented in completely interactive ways. After the Math Museum, I went to the Intrepid Sea, Air and Space museum. It’s a mostly military museum, but was unexpectedly one of the coolest museums I had been to. 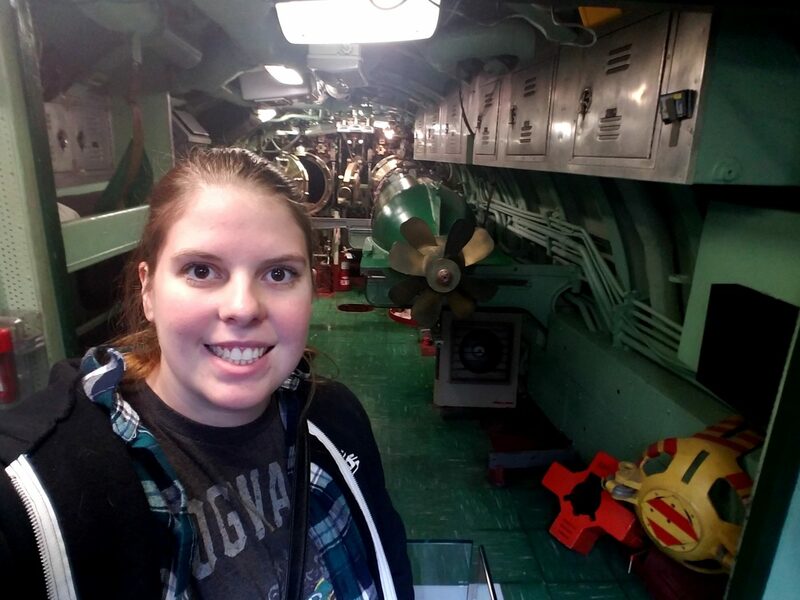 I went on the tour of Growler, the only US missile submarine open to the public in the country. It was neat getting to learn the history of Growler and how it related to the Cold War and technology at the time. After growler, I boarded the Intrepid and got to see a whole new set of exhibits. Everything from the history of different planes to how the navy recruited during different times. There were planes from different eras all the way through the space age. There were short informational videos that really highlighted different aspects of what it would have been like to be aboard the Intrepid during war time. The view from the flight deck of the river and the city was also pretty neat. I was surprised at just how much I enjoyed the Intrepid, but it really was a neat look at history and science as well as the military side of things. After the Intrepid, I squeezed in one more stop at the Hamilton Grange National Memorial. The memorial is set up in the only house known to have been owned by Alexander Hamilton. While the house has moved a couple of times and most of it is a reconstruction now, it was still a really interesting look not only at the history of Alexander Hamilton, but also of how we have viewed historic places overtime. As with the Theodore Roosevelt site, the first floor is museum, and the upstairs area has period rooms. I did get to go on the tour of the period rooms at the grange, and the tour also included a lot of interesting history of the building and reconstruction process. The grange had been owned by a church and had been moved twice. When it was owned by the church, there were also some pretty significant remodeling changes that happened. Seeing the transformation and the evidence of the old changes in the walls was really neat. It was also interesting to think about how much things have changed over time. When Hamilton built the house, it was in the country, an hour and a half outside of New York City; now it’s very much in the city. The current location of the house is in a park to try and portray some of the open country space that the original location would have had, but it’s still crazy to think of part of Manhattan being in the country. After a full day in New York City, I began my second day of adventures to Rhode Island. I thought Rhode Island would be an easy set of stops for one of the first weekends here, and other than the dreary weather it was a wonderful and relaxing day. I started out at the Touro Synagogue. It is the oldest synagogue in the United States, and it has been the site of several important events throughout it’s history. It was the first place where Jews openly practice their religion in the United States. It served as a hospital for British troops during the Revolution. George Washington delivered a letter and spoke to the congregation about religious freedom in the United States leading to Rhode Island signing the constitution. It served as the governmental headquarters of Rhode Island following the revolution. Today, it is home to an Orthodox Jewish community, and serves as an active synagogue once again. The synagogue still has their original Torah Scrolls from the 1700s, as well as their original menorah and several original light fixtures. After the synagogue, I went to Providence for my next adventures. I started out at the Roger Williams National Memorial. The memorial itself is really just a park. No statues or big things to see at the memorial. There is a visitor’s center that has a really informative short video about Roger Williams. The rangers a the visitor’s center were also really knowledgeable about the surrounding area and attractions. I took their advice, and saw the longest stretch of continuous colonial houses in America, and I stopped by the First Baptist Church in America. Walking around Providence felt very much like walking back in time. I stopped at the RISD Museum of Art while I was walking around, and it was an interesting stop. Because the museum is built on a hill, the floors didn’t alway connect in ways that made sense, and the exhibit map was a little hard to follow. I don’t think I saw all of the exhibits, but I know I walked around a few of the exhibits multiple times trying to find the next floor or exhibit. I did think that it was really neat that they had an entire exhibit for student works. It was neat to see how the future off art is being made right now. After the RISD museum, I went to the Haffenreffer Anthropology Museum. The museum is located inside of a building on the Brown Campus and is a teaching museum. The space is very small, but there was a lot of information packed in. There were 3 small exhibits that could easily have been on display at any natural history or science museum. It was really neat to get to see the exhibits in the context of ongoing research. There was a Culture Lab in the corner of the museum where classes or lectures about the collections not on exhibit could be offered. Getting to walk through some of the Brown campus was also pretty neat. Overall this week was a pretty successful first week of exploring, and I definitely have a lot more planning to do before my next adventures.